﻿﻿﻿Perry Reeder gave his Bayocean presentation to a packed house at the Tillamook County Library on August 19th, 2015. 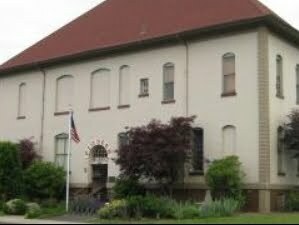 Sarah Beeler did a great job of promoting the event by placing a sign at the entrance to the library and advertising in the Tillamook Headlight Herald weeks in advance. 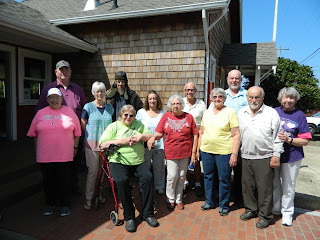 I posted in on several Facebook groups and saw a few history friends in the audience, some even came over from Portland. 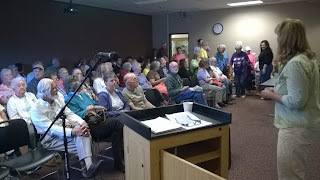 Unfortunately, our efforts were so successful, and the interest so high, that some folks had to be turned away, but not before Perry promised them to schedule another presentation. It will be October 24th at 1 PM. Perry used a PowerPoint slide show, created by his daughter Sarah MacDonald, to accompany his telling of the geological processes that caused Bayocean's demise - and its human impact. Perry added some entertaining personal stories along the way. After an hour or so, he answered questions from the audience. Earlier in the day Bayocean/Cape Meares alumni gathered at the community center/schoolhouse to reminisce. They were gracious in letting me hound them with questions. Perry's family moved to Bayocean Park when he was six years old - in 1944. With his buddies, he explored the ruins, yelled at the blimp pilots as they passed close overhead each day, kept cool snorkeling along the sandy shores of the bay, and listened to Mr. Mitchell's sermons while waiting for the bus or buying candy at his store. 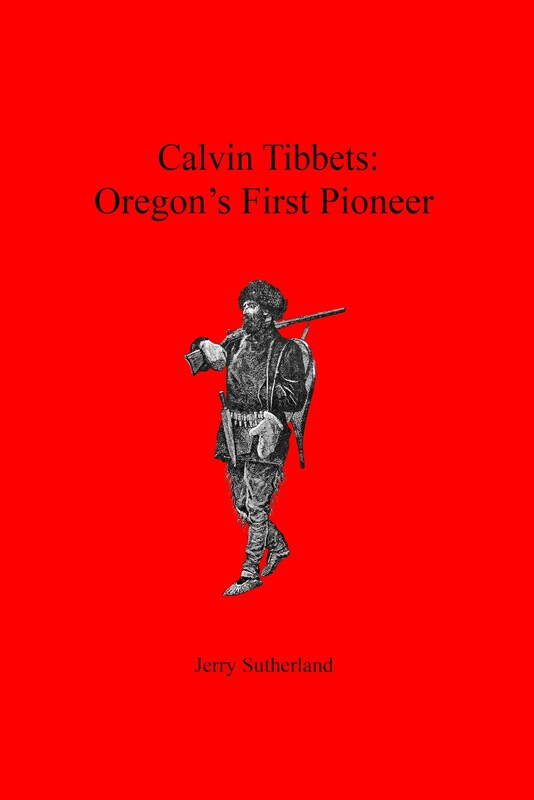 In 1950, watching the sea moving relentlessly closer, his family moved to Cape Meares. There he eventually raised his own family while watching Bayocean's destruction - and rebuilding. Prior to construction of Tillamook Bay's South Jetty, the US Army Corps of Engineers hired Perry to captain a charter boat, from which their engineers and scientists took measurements that helped finalize its design. From 2002 to 2003 he served on the Bayocean Task Force. Perry owns a piece of property on the spit. 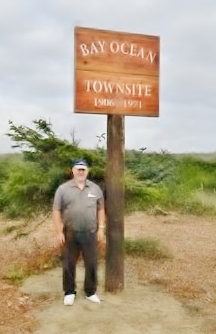 A few years ago he coordinated county and family efforts to post signs that show where the business center of Bayocean had once stood - on the bay side of the spit. The fact that the signs are near the ocean side of the spit graphically illustrates the extensive geological changes that have occurred. Perry now lives in Oceanside and spends most days managing his family farm in Beaver. In July 2017 Perry and his daughter Sarah wrote Bayocean: Memories Beneath the Sand.